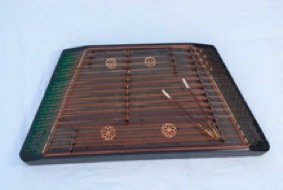 This santouri is a Greek version of the santur, played mostly on the islands rather than the mainland. It is a relatively large and fully chromatic instrument, which gives it great flexibility and depth of sound. It is closely related to the cimbalom, which is most associated with Hungary but is found in various versions throughout the Balkans.